How well does your website traffic convert? Does your website set you apart from the competition? Is your website representing your brand? Your website is a marketing tool. More and more, customers are conducting business online and your website is often the customer’s first point of contact with your brand. If your site is confusing, looks homemade, or simply isn’t functional, your online visitors will make negative assumptions about your business. Quick, you have three seconds! Visitors make their decision whether to stay on a site or click the back button within a matter of seconds. There are many reasons why a user might get the wrong impression and abandon your site. If you page fails to load within 3 seconds for instance, 57% of consumers will abandon your site (newmediaandmarketing). Do the three second test, or “blink test,” on your own website — if it takes longer than 3 seconds for a visitor to determine what your site is about and what to do next, go back to the drawing board. For the Home Service Industry in particular, it is extremely important to instill a feeling of trust and comfort in the user visiting your site. Understandably, people don’t want to invite strangers into their home. Prove to your website visitors that you are friendly and trustworthy. This is easier said than done: trustworthiness is conveyed through quality images, content, layout, functionality, and branding. If you want to make sure that visitors not only choose to stay on your site but also click to sign up, schedule service, or make a call, you need to have certain strategic elements in place. Increasing the impact and value of your website is not easy, but there are certain things you can do to convert website visitors into qualified leads. Logo – The foundation of your brand is your logo. It’s how people identify you. Make sure you invest in a good design and show it off! Placing the high-quality logo on the top left-hand corner of the page gives it the prominence it deserves. Link the logo image to your home page. Use your logo everywhere, on images, videos, products, infographics, profile pictures, and more. About Us – It is amazing how many sites don’t have an “About Us” page. While it may be tempting to focus on other things during the design process, there is simply no excuse for neglecting one of the most important pages on any website. If you don’t have an official mission statement, credo, or core values, it is time to embark on a path of business self-discovery. What values/benefits are we bringing? In addition to having the core information about your brand, here is the area to get creative, tell a story, and show some brand personality. How and why was your business created? Humanize your brand by telling a good story. Once you have discovered your brand image and mission, you can begin to implement your brand messaging into all of your marketing efforts. Being clear about the tone and messaging of your brand will make it easy for every employee to implement your brand’s attributes into their communications. Your brand messaging should be integrated into the way you give sales presentations, pick up the phone, send emails/newsletters, and your overall marketing strategy. A good tagline is a memorable phrase that captures the essence of your brand. Often a tagline is embedded in your company logo and graphics. Like your logo, it will stay around for a while. Make sure you have a tagline that is short, memorable, and representative of your company. Do you have a tagline that sticks? If you don’t, take some inspiration from some famous taglines, such as “The Happiest Place on Earth” (Disneyland) and “Are You In Good Hands?” (Allstate). Even more important than having a well thought out logo, mission statement, and tagline, is consistency! All of your branding efforts will fall flat if you do not maintain the general look and feel of your brand. If you can’t keep up a consistent brand and voice and back up your brand’s promises, your brand will fail. When developing the branding for you website, it is highly recommended that you consult with a marketing team if you want the best results for your site. Before you begin planning and designing a website, you should spend some quality time thinking about your business, logo, mission statement, taglines, slogans, voice, tone, color scheme, and making sure that you can live up to your brand’s promises. Besides your phone number being clearly displayed above the fold, it is important to have a “Schedule Service” online form as well. Having these two CTAs strategically placed on your website will help to increase conversions. Make sure that they are large and stick out. Choose colors that contrast and use white space to bring the most attention to your CTAs. Other CTAs include adding an item to a shopping cart, requesting information, signing up for a newsletter, downloading something, making a donation, or anything else you can think of that someone can do online. For fast and efficient communication, you can try implementing a live chat option on your site. Just be careful to implement it well and make sure it isn’t frustrating the user. Having contact information and strategic calls to action in place give your visitors clear options for what to do next. After all, the purpose of a CTA button is to have a visitor actually do something. If you are offering a deal or sale, make sure to advertise it on your website. When an online shopper clicks on your CTAs, they should be linked to the relevant page/form. Be strategic with your CTAs and trust your web design team to come up with the best way to display them. Utilizing white space effectively is a must for having your CTA stand out. It is also extremely important that you update your deals and other expiring CTAs frequently, since outdated and misplaced CTAs can signal to the user that your company is small, unprofessional, or even out of business. A great website uses CTA buttons strategically to guide users where you want them to go. Too many times, business owners and web developers will choose to focus their time on the bells and whistles of website development rather than on the things that really matter, like your unique selling propositions. These are the statements that clearly define what benefits you can offer your customers. They are normally the first thing a customer sees on your website and can make or break the “blink test” moment. In order to keep visitors from clicking on the back button, you need clear value propositions to describe why you are the best choice, distinctly superior to the competition. If you haven’t yet developed a branding strategy, you will want to go back to the basics first and think hard about your company and its benefits. Your brand strategy revolves around how to communicate your brand image and promises. Be concise and meaningful in your USPs and make them prominent. If you have slider images on your website, use concise and engaging headlines to state what you do and how you can benefit the user. The images and text should support each other to communicate your USPs. Click here to see 10 Value Proposition You Wish You Had to inspire more original and engaging USPs. Although stock images of technicians, smiling customers, and beautiful homes can be used to supplement your text, we recommend investing in unique, high-quality photos of your actual technicians, customers, and trucks to show what your company and brand is really about. If given 10 seconds to explain why your company is the right choice, what would you say? Use this exercise to come up with the USPs that give you a competitive advantage. Try to answer your customers’ questions before they have a chance to ask them. Another way to convince your online visitors that you can be trusted to do a job well done is to have “Trust Seals” on your website, such as Angie’s List Super Service Award, Reader’s/Consumer’s Choice Award, and BBB A+ Accredited Business to name a few. Satisfaction Guaranteed seals are also important for instilling confidence in your products and services. Longer guarantees and warranties will increase your leads even more! Think about the text and images on your website. Are the sentences easy-to-read and provide a clear picture of your services and benefits? Do you have high-quality images, videos, and blog content? Is the content original? The people coming to your website don’t want to think. They aren’t going to your website to experience the beauty of a poem or novel. If they have to think too hard, they will end up leaving. Save the industry jargon for seminars and interviews. Your visitors appreciate layman’s terms and straight talk. You can facilitate this understanding with relevant images and video. Useful visuals will keep your visitors on your page longer and better explain your features and benefits; however, if they don’t enhance the meaning of the text, you could simply be adding confusion. Be strategic with your images and video – if they aren’t adding any value, don’t use them. From landing pages to websites and social media, the key to success is valuable content that users actually want to consume. Try to avoid stock images. People want to be able to trust you. Show them images of your actual technicians, equipment, customers, and location. Having short and concise paragraphs that provide helpful, actionable information is easier said than done. The content you get is the content you pay for. Re-posting or regurgitating old content, outsourcing cheap content writers, or having a non-writer compose the content for your website is a mistake. It will only result in a waste of time, money, and resources. Take the time to create great content now so that you don’t have to do it all over again later. Original, high-quality content will give you a good SEO standing and continue to convert online traffic for years to come. If you want a professional website, it’s best to have a writer, graphic designer, and web developer who work together to craft the content and layout of your website. For greater exposure in search engine results, you need a high quality site. Google will penalize your website for using duplicate content, keyword stuffing, broken links, spun content, content farming, black hat SEO, or other “bad practices.” Read 50 Reasons Your Website Deserves to Be Penalized By Google for more information on Google’s ranking algorithms. For more information on “black hat” SEO techniques, read our blog, SEO Dinosaur: How Content Marketing is Replacing Extinct SEO Tactics. For SEO, social media, and customer retention/acquisition purposes, we recommend making continual updates to your website or blog. Fresh content is essential! The more your site adds new and useful content the more you will be able to lure web crawlers onto your site and get more of your website’s pages indexed by Google. Writing on multiple topics, diversifying your content, getting listings and links from around the web, and publishing new pages will help you generate leads and attract web crawlers. Presenting valuable and informational material on a consistent basis will not only help you with your search engine ranking, but it is also indispensable for fostering trust, authority, and personality. Your blog is a great place to start. Having thoughtful branding, well designed graphics, videos, and other useful and compelling information means nothing if your visitors cannot find it. Easy-to-use navigation should silently guide the user through your website’s elements. This invisible art is essential for an effective website. Having a polished professional look with easy-to-use, intuitive navigation on the top navigation bar and in sidebar and footer links makes it easy for your visitors to navigate around your site. This may seem like a no-brainer, but keep in mind that many websites fall short due to drawing attention to the wrong parts of the page. Well-designed navigation is so important because consumers don’t have the time or patience to figure out where to focus their attention or how to use your site. Although no one intentionally designs a confusing, hard-to-navigate site, it can easily be done by going overboard with images, fonts, CTA buttons, flashy gimmicks, and other visual clutter. If the user can’t find the information they need, they won’t read it. If the average person cannot figure out how your site is organized or where to click to get the information they want, they will simply click the back button. The goal is to keep it simple, trustworthy, clear, intuitive, clean, and reliable. Your calls-to-action should be placed prominently above the fold, along with your contact form and/or phone number. Slider images are good, but they should not overwhelm the fold and/or confuse the user. We recommend keeping your slider images to under 2/3 of the fold in order to allow room for your CTAs. Keep in mind that people might navigate to your site in a variety of different ways, so make sure that no matter what page they land on, they can easily move around your site to get where they want to go. In fact, we take a lot of lessons from our PPC landing page designs in order to make sure that no matter what page the user lands on, CTAs and key information are there and navigation is clear. The images should show off your service and/or offer in a way to supports the text, which should be descriptive, concise, and meaningful. A visitor needs to know exactly what they are looking at, what your services are, and how to smoothly navigate from one page to another. Navigation is extremely important for web crawlers to understand your directory structure. Create navigation that is designed around ease-of-use for your users, not for search engines. Trust your professional web design team to create a naturally flowing hierarchy from general to specific. Effective user interface design is where most websites fall short. This encompasses a lot, but basically you want a site that loads fast, is mobile-friendly, uses best practices for coding and SEO, original content, consistent updates, and offers quality services. But there’s much more! Navigation, social proof, backlinks, keywords, usability, indexable content, title tags, meta descriptions, branding, url structures, and much more impact the search engine results for your business. It’s complicated; we know! (Read Google’s Search Engine Optimization Starter Guide for more information on current SEO strategy). For this reason, don’t think that you can design and maintain your website by yourself. Since we sell website design services, it is obvious that we are going to recommend having a website development team handle your website, but it’s the truth regardless. Hiring a web designer and developer is more important than ever to make sure your website has clean code and adheres to best practices according to the standards of authoritative institutions like Google and W3Schools. The old SEO tricks are gone. No longer can we find loopholes for getting ahead in the rankings. It may be harder to get to the top of organic listings now than it was just a few years ago, but the new changes are better for all of us. Everyone is now being forced to think much more about the user’s experience rather than how to trick search engines. Inserting nonsensical keywords, hidden or duplicate content does little for your users and will now get you penalized by the web crawlers. Responsive, mobile-friendly websites should be a given at this point, but for those of you who had a website developed 5 or 10 years ago and have failed to update it since, you are definitely behind the game. To get ahead, it is recommended that you get a professional web development team to audit your website and provide you with overhaul strategies. The key to a successful website is constant testing. Test your website on all the different browsers and web devices. Load time is a big issue, which is why it is important to test, especially on mobile devices and tablets. Lots of things can slow down your website, including videos and images that have not been optimized for multiple browsers and devices. All websites should be built with responsive design, allowing the screen to display in all browser sizes. As a business owner, digital marketing and websites can get expensive, fast. Search engine optimization, paid search, web maintenance, social media, blogging, email marketing, and other digital marketing solutions can create more complications than they are worth. 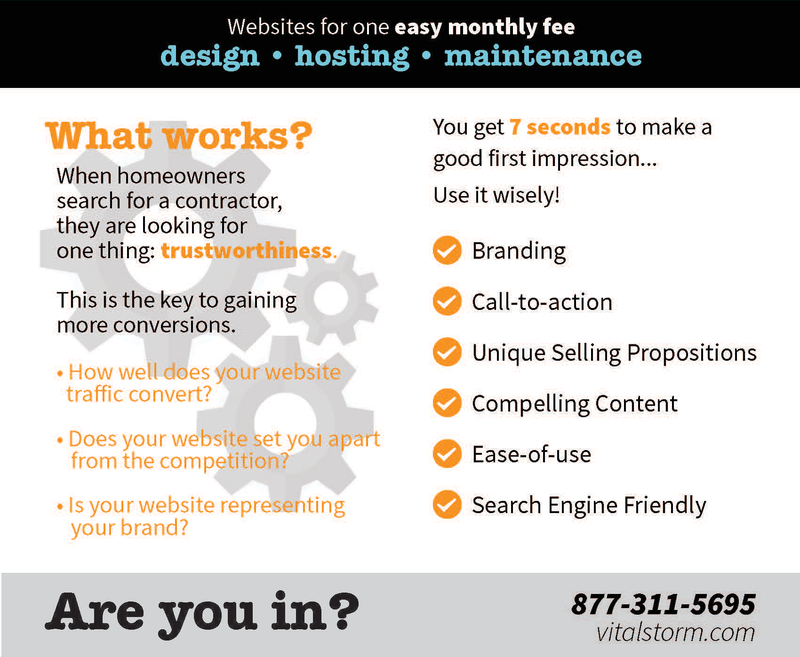 Call VitalStorm for your free web marketing strategy evaluation so that you don’t put your eggs in the wrong basket. Now that you have the information to begin evaluating your website, you can begin undertaking these steps to redesign your website with the above goals in mind. Too busy? Not a problem! That was a lot wasn’t it? Fortunately and unfortunately, website development is getting more and more complicated as the competition grows fiercer and search engine algorithms get more complex. That is why it is more important than ever to have a professional web design team conceive, code, and market your website for you. We have found that paying a high price for a website, only to have it handed over for you to figure out hosting, updating, and maintenance, just doesn’t work for the Home Service business owner. The one-and-done model just won’t cut it. There is simply too much work and maintenance to be done. Buying a website can cost you upwards of $10,000 and will likely not include changes, maintenance, search engine optimization, paid search, web hosting, social median, email marketing, blogging, or other services associated with developing and maintaining a website. Due to the expense of designing, hosting, maintaining, and optimizing a website, many business owners either skimp on other important marketing activities, throw a generic, brochure-looking website up, or fail to have a website entirely. Don’t lose hope! Fortunately, there are ways to succeed in the digital space without having to spend a small fortune. For this reason, we recommend building a long-term relationship with a team that will keep your site living and breathing the way it is supposed to. This is the website and SEO solution that we provide our clients. We assume the responsibility of hosting and maintaining your website for the long haul. This provides a comprehensive solution for our clients and allows them to only have to deal with one team for easier, faster communication. Any desired changes can be made with a simple email or phone call. No more waiting weeks and paying large hourly rates for small changes. 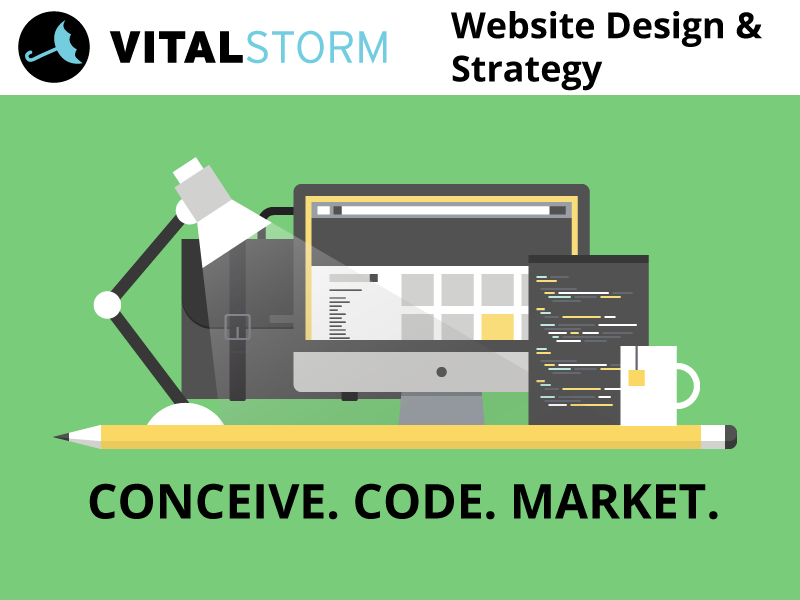 At VitalStorm, we don’t charge a large lump sum upfront. We plan to get paid for our services as we continue our relationship with you. So, the way it works is we charge a small startup fee and then another small monthly fee for hosting, maintenance, and updates. Since we only work with Home Service companies, we know exactly what works and what doesn’t. We love what we do and it shows in our work. In this highly competitive Home Services industry, you wouldn’t hire just any technician, nor would you trust them in your customers’ home without thorough training and ongoing evaluations, so why would you trust your web strategy to anyone other than a dedicated web strategy team? Before we begin renovating and redesigning your website, we will begin by sending you a wireframe, where we allocate your website’s real estate and develop a content hierarchy. After gathering some information from you, we will get to work designing and writing original content. Depending upon on-time communication, we can get your new website launched within a month! Free Consultations. Constant Contact. Affordable Monthly Pricing.